Check stems before and after swathing for clear signs of disease. If you see damage like that shown in this quiz, can you identify the disease? The combination of swathing canola too early (low seed-colour change) and swathing during a stretch of hot weather can lead to rapid curing that leaves green counts elevated. By leaving the crop standing until 60% seed colour change on the main stem, this should reduce the amount of green immature seeds on side branches, which will reduce the green-seed risk in the combined sample. Reader question: Does green content go down in the bin? 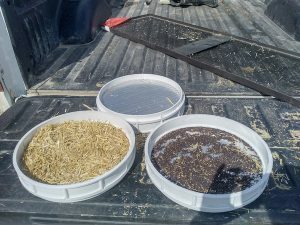 Some researchers found that long-term storage may decrease green seed count slightly, but farmers should not count on a significant improvement in storage – especially if seeds are very dry. With hot and dry conditions, a lot of canola is well below the 10% moisture considered “dry” by grading standards and often below the 8% moisture level considered safe for long-term storage. What can you do? Canola producers can lose up to five bushels or more per acre if the combine isn’t adjusted properly. Here are tips to measure combine losses and make adjustment to limit those losses, putting more canola in the bin and reducing the volunteer canola seedbank in your fields. Canola binned hot, even if it has low moisture, low dockage and low green, should still be put on aeration. This will even out the temperature throughout the bin and help remove moisture from respiring seed. Even at low moisture, convection currents within the bin could concentrate this moisture. For safe, long-term storage, canola should be conditioned with aeration to less than 8% moisture and cooled to 15°C or less. Pod splitting or pod drop due to tissue damage from the heavy frost usually starts within a day after the frost event. 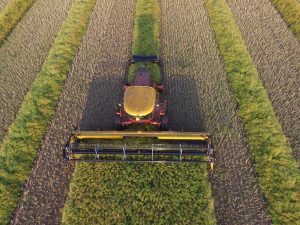 If the canola crop is still sound after that time, growers can probably stick with original plan – whether that be swathing at 60% seed colour change or straight combining. 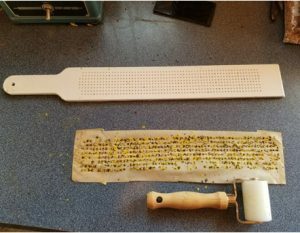 Identifying verticillium. Or is it blackleg, sclerotinia or grey stem? 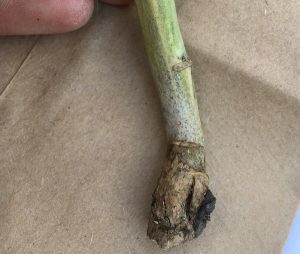 If whitened canola stems are peeling and have black spots under the peeled layer, the cause is likely verticillium. Seeing this? Please get it checked out and let us know. We’re trying to find out how widespread the disease is. 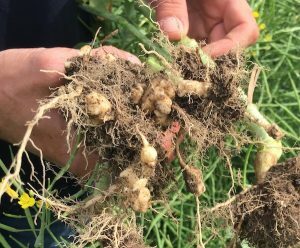 Clubroot scouting continues across the Prairies this week, especially in areas where it was just recently confirmed. Ideal timing for post-harvest jobs varies from right after combining to just before winter. Here is a list of post-harvest field operations and the ideal times to do them.